True, Barbell Rows Are Harder Than Pulldowns and Dumbbell Rows! Why can barbell row benefits trump dumbbell rows? Today, in fact, I did barbell rows with 95 pounds. Even though when I was doing dumb bell rows with heavier weights, almost 60 pounds for each dumb bell, there is no question that the barbell row is more difficult. With a dumbbell row, you can stabilize yourself on a bench, which makes the whole movement feel a lot easier than using the bar where you have no stabilization, besides your own back muscles, hips, legs, abs. So, yes, I have done pulldowns many times over the years, with no visible benefit, as well as the dumb bell rows, which I think had a bit of visible benefit, but I can tell now that the barbell row is the way to go for overall impact. It is harder and deserves respect, which means a proper warm up and stretching, as well as going up in weight slowly. No ego, fewer injuries, especially for regular folks like us just trying to get into great shape. I have culled some of the major barbell row benefits from several sources which are credited at the end of the post with their links, so you can find their full articles there. But for our purposes, I want to motivate you to include it into your workout as part of the big 5 that are recommended by Mehdi of https://stronglifts.com, which has been my guide for the last 6 months in strength training. I think it is important to glean the most important information for yourself, but then you have to test it out with your own body, so you cannot totally rely on anyone else's suggestions, but try out the stances, warmups, sets and repetitions and see how you feel. No matter what, have no ego, increase your weight gradually so you can avoid injury and keep getting stronger, that is key. Bottom line, these excellent barbell row benefits can help you to really build a much stronger back and improve your posture. Barbell rows are one of the most effective exercises for the large muscles of the back including the latissimus dorsi and the trapezius. Barbell rows also have the added benefit of improving posture, as they employ the postural muscles the posterior deltoids and the rhomboids. Jessica Matthews, M.S., adds that because barbell rows are free weight exercises, they utilize more stabilizer muscles, which provides the added benefits of burning more calories and building more muscle mass overall. Totally accurate, even before pulling the weight, you can feel your body setting, engaging for the rows, you will feel your entire core flexing, which is much different than sitting on the bench doing lat pulldowns where the movement is very isolated to your lats, as well as is the case for dumbbell rows, where you are fairly relaxed using the bench to stabilize you, and the lats again are fairly isolated. The barbell row benefits your lats. The latissimus dorsi muscle is one of the primary muscles involved in the barbell row. This large muscle stretches all the way from the top of the arm to the pelvis and its chief function is to pull the arms back in the rowing action. The main barbell row benefits for the latissimus dorsi is postural; a strong latissimus dorsi helps to maintain an erect posture and helps to keep the shoulders from slouching forward. Barbell rows also involve the posterior deltoids — the muscles at the back of the shoulder. Although much smaller than the latissimus dorsi, these muscles are also deeply involved in posture, and the barbell rows help these muscles to maintain the position of the shoulders. Paul Sorace, M.S., explains that free weight exercises like barbell rows provide additional benefits to the posterior deltoids in the area of balance, stabilization, muscle coordination, and muscle control. Located between the shoulder blades, the rhomboids are one of the most important postural muscles. Weak rhomboids create the slumped forward, round shouldered appearance indicative of poor posture. The squeezing action of the shoulder blades that occurs at the top of the upward phase of the barbell row exercise especially helps to develop these important muscles and maintain proper posture. 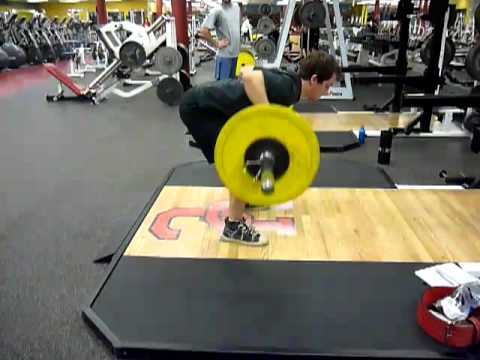 The barbell row is an advanced exercise that requires correct technique in order to avoid injury. One of the most common errors in performing this exercise is to stick the buttocks out while doing the lift; however this action places excessive strain on the lower back. It is vital to engage the abdominal muscles as you pull the barbell in the rowing action to maintain a neutral spine position for the duration of the exercise. What barbell row benefits have you experienced? Please share. Here is a video from StrongLifts which shows how to do the barbell row, sometimes also called the Pendalay Row.